This is a premium hunting version of the venerable 7.62x54R that can offer a level of attention to detail and tolerances that cannot be matched by military surplus rounds. This Prvi Partizan 7.62x54r ammunition is a gorgeous brass cased, polished version of the round we all know and love. They aren’t insulting the shooter’s intelligence by vastly over pricing the round either, it is reasonable given the type of load it is, and the expensive components involved. The 182 grain projectile is a boat tail base full metal jacket, copper jacketed projectile that is made to the original military specification for design and weight. Frankly, your Mosin-Nagant rifle is not worthy of an ammunition this good! 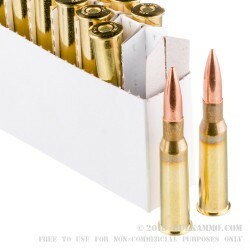 Non corrosive, Boxer Primed and Brass cartridge casing is not a set of words usually used to describe the 7.62x54R. This is simply an upgraded, reloadable, precision made example of a round that has been proven in many decades of combat. The tolerances and build quality are superior. The ballistics are generally the same as the military round and the harmonics of the bullet to barrel is identical. There is no drawback to using these rounds for precision work or hunting with your 7.62x54R rifle of any type, semi auto or bolt action. 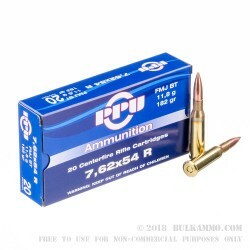 GREAT Ammo, and it's reloadable boxer primed brass. Q: Is this ammo corrosive? I bought some but couldn't find a non-corrosive label unlike the TulAmmo, which I also have, that does say it isn't corrosive. Posted On: 10/17/15 By: Collin S.
A: Hello Collin, The Prvi Partizan ammunition is all new manufacture and does not contain any corrosive components. Posted On: 1/3/14 By: George H.
A: Hello George, These 182gr. FMJ rounds by Prvi in 7.62x54R are non-magnetic. They have a lead core, copper jacket, and are brass cased and boxer primed. A: Unfortunately this will not work. 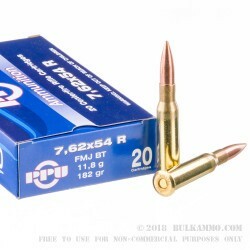 The 7.62x54r round is designed for a specific chamber commonly found in the Mosin Nagant. 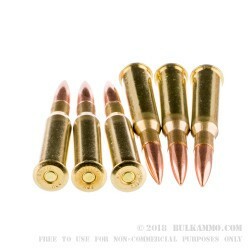 The 7.62x51 is similar to the 308 round, which may be shot in a 308, though neither of these are interchangeable with this 54r which features a rim on the cartridge.